Follow the Leader? Testing for the internalization of law (with L. Panzone and T. Swanson). The Journal of Legal Studies. Accepted. Linking precolonial institutions with ethnic fractionalisation: what are we measuring? The Journal of Institutional Economics. Accepted. Online appendix. On the perils of commitment to punishment when criminals are strategic (with M. Sarr). The Journal of Legal Studies, 47(2), 2018. Do voluntary commons associations deliver sustainable grazing outcomes? An empirical study of England (with T. van Gevelt). Environmental and Resource Economics. Forthcoming. Dictators Walking the Mogadishu Line: How Men Become Monsters and Monsters Become Men (with M. Sarr and T. Willems), The World Bank Economic Review, 32(3), 2018. (with F. Rauch and T. Willems). The Quarterly Journal of Economics, 132(4), 2017. Documenting legal dissonance: Legal Pluralism in Papua New Guinea (with T. Swanson), Review of Law and Economics, 11(1). 2015. Internalising Legal Norms: An Investigation into the Legitimacy of Payback Killings in the New Guinea Islands , Law and Society Review, 49 (1). 2015. Taking Customary Law Seriously: A Case of Legal Re-Ordering in Kieta, Journal of Legal Pluralism, 45(2). 2013. 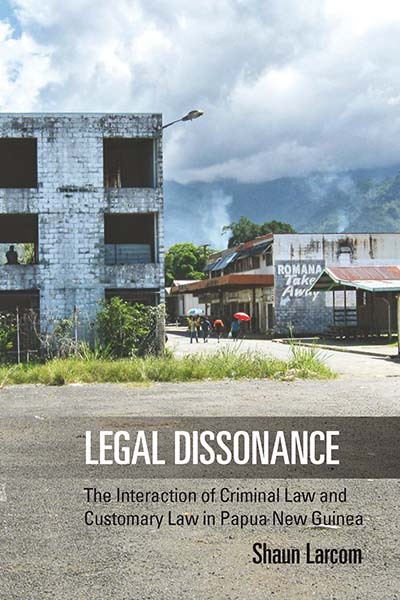 Legal Dissonance: The Interaction of Criminal Law and Customary Law in Papua New Guinea (2015 Berghahn Books: Oxford). Scaling the nexus : Towards integrated frameworks for analysing water, energy and food (with S. McGrane et al.). Geographical Journal. Forthcoming. The potential impact of Brexit on the energy, water and food nexus in the UK: A fuzzy cognitive mapping approach (with Ziv, G. et al.). Applied Energy, 210, Jan 2018. Time-Consistency and Dictator Punishment: Discretion Rather Than Rules?” (with M.Sarr and T. Willems), 2016, in T. Besley (ed) Contemporary Issues in Development Economics, Palgrave Macmillan.